Kunal Dalvi pitches his company Foodrop at the NUvention: Web + Media final presentations. And one interdisciplinary student team hopes to make it a thing of the past. Dalvi’s team’s solution, Foodrop, was one of the seven new, student-created, online businesses introduced at the final presentations of NUvention:Web + Media, a two-quarter course that requires students to collaborate across disciplines to design, plan, and launch web-based businesses. On Tuesday, June 7, members of the class “pitched” their final products to an audience of faculty, peers, guests, and members of the NUvention board of advisers. 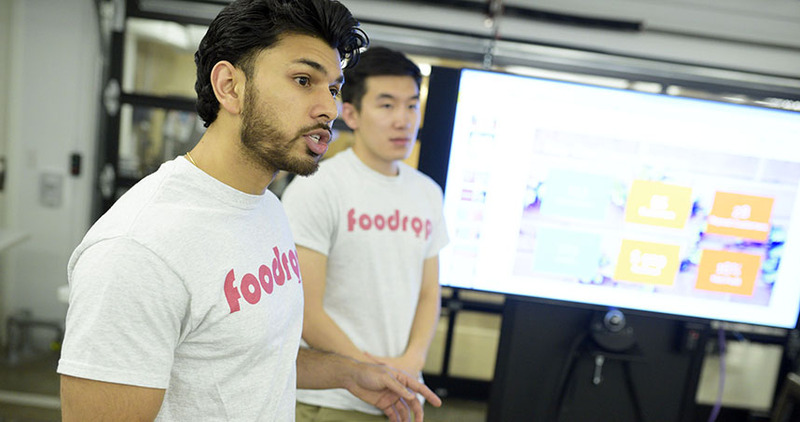 Created by two MBA students and three engineers, Foodrop is a streamlined, online food delivery platform. While many people enjoy the variety of ordering food delivery, they are deterred by the expense and sometimes long wait times. Foodrop curtails these issues by partnering with restaurants to offer delivery without fees for bulk orders. Here’s how it works: each day, Foodrop features a different restaurant, which offers a limited menu of popular items. Foodrop subscribers place their orders by the 10:30 a.m. cutoff time, giving the restaurant time to plan and prepare the order. Then a restaurant employee drops off the entire delivery at a specific time at one central location to be picked up by various customers. The Foodrop team said the model is particularly popular for restaurants just outside of the normal walkable range. The restaurants are willing to offer discounts and free delivery with the opportunity to expand their business. And customers are excited for newer options that are typically harder to reach. Foodrop’s menu will rotate options on a weekly basis to include more variety from both national chains and local shops. 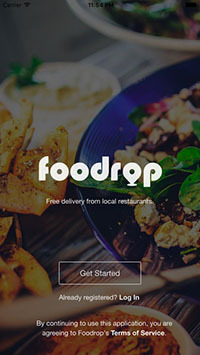 Foodrop launched a pilot at Kellogg with five Evanston restaurants and plans to launch the business campus wide in September.